How do you celebrate 40-years in operation as a non-profit providing services to those with disabilities? If you are Columbia's Alternative Community Training then you host a roller derby match. KBIA's Darren Hellwege talks with the director of Alternative Community Training about the creative way that that organization will celebrate its 40th anniversary. 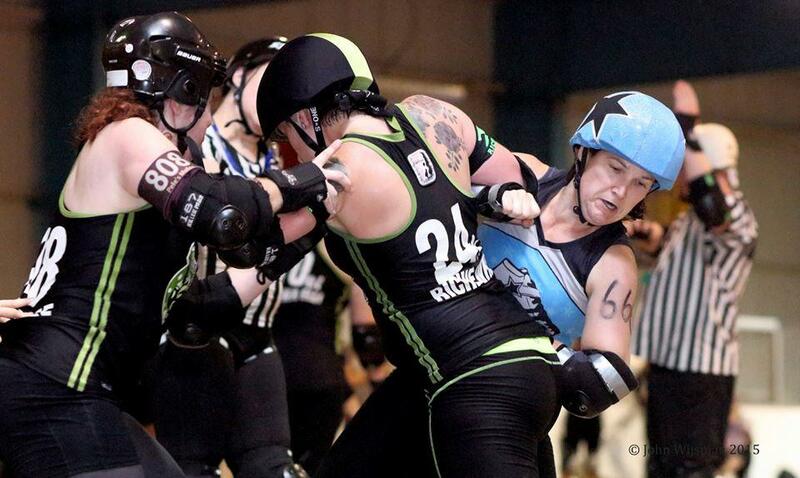 COMO Derby Dame Dethblok (or Jennifer Bean) gets in the middle of things at a recent match. The COMO Derby Dames scrimmage this Saturday, August 8 at Fr. Tolton High School as part of the 40th anniversary festivities for Columbia's Alternative Community Training, or ACT. In discussing the non-profit Alternative Community Training of which he is Executive Director Mark Hassemer noted that for over 40 years the organization has provided support and services to over 400 individuals annually. These services include a day program, community living program and an employment program. The school of thought is so different today from how it used to be. Thirty-five years ago we followed a medical model. We looked at people with disabilities and said 'What is wrong with them?' and we tried to establish goals and objectives that would help fix that... Today it is really 180 degrees different. We look at everyone even those with significant disabilities and say 'What are your dreams, interests and desires?' We look at the capacities that everyone has and start building plans around that. When the discussion arose about how to celebrate ACT on that organization's 40th anniversary, staff were looking for a celebration that wouldn't be "boring chicken dinner or a 5-K." In search of something unique, Hossmer agreed to pair up with COMO Derby Dames. Columbia's local all-female roller derby squad was looking for a chance to re-introduce their team and sport to Columbia after a period of playing in Jefferson City. The event 40 Years and Still Rollin' is a celebration of ACT's 40th anniversary. The COMO Derby Dames will square off on Saturday, August 8 at 5:00 p.m. at Columbia's Father Tolton High School. Listen for new episodes of Thinking Out Loud each Tuesday at 6:30 p.m. on 91.3FM KBIA.